I admit it. I read the obituaries. I’m not retired and I’m not feeling old. I’m not fascinated with death and I am not morbid. 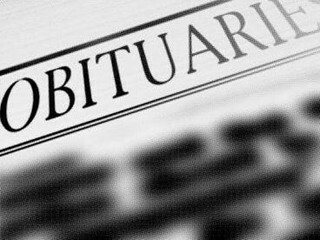 My mother and father read the obituaries regularly. They check out my hometown newspaper on the internet since they’ve lived in independent living for the past six years. Several weeks ago was tough, because several people died who they knew. When more and more of your friends and family are dying then I guess you feel like your number is coming up too? I’m a health care provider and I started reading the obituaries when I got reports of my patient’s deaths. I wanted to see where the memorial or funeral service was being held. In a big town newspaper, not everyone’s death is posted in the obituaries. In a small town it is common news that is posted. I live in a large metropolitan area and if someone is cremated, a funeral home isn’t involved, or the family doesn’t have money to pay for the announcement, it will never appear in the paper. Time magazine and internet websites post obituraries of famous people. They post a picture and a guest writer who knows the person will pen a fond memory. It’s a brief synopsis capturing the highlights of a famous life. After reading lots of obituaries and I’ve decided that everyone is famous. Each person has lived a life completely unique to anyone else and they touched the lives of many people along their life journey. Where that person was born, where they went to school, where they worked, who they married, how many children and siblings they had, and what contributions to society they made. Several years ago I asked my mother to write her life story. She sat down and wrote 9 or 10 pages. It was beautiful. My mother wrote about games she played, going to the movies, and running around with her girlfriends. Pages of happiness were exuding from the paper. My mother was the youngest girl out of seven siblings. She was happy-go-lucky. Everyone in the family protected and took care of her. She had so much fun. My mother is 85 years old and she is not so happy-go-lucky right now. She is plugging along trying to get through her day with her many physical ailments. Despite the tears and triumphs of our relationship, I will carry with me my smiling, laughing mom. As I write this, I learned of my aunt’s passing. She was my mother’s oldest sibling and she was 100 years old. I read her obituary today. It had the basics but it also had a glimpse of her personality and her boat the “Ma Belle”. I remember seeing pictures of that boat that she and my uncle would take out on the Mississippi River. They loved talking about the fun they had. I’ve taken stock of my life the past year, since my mother has been ill. I’ve accepted where she and my father are at on their life journey and where I fit with them and my siblings. I have maybe a good 30 years left in my life and a large part of my life story could be written today. But then again, I’m not dead yet. I’m sure I’ll have more to add. This entry was posted in Family, Life, Mid-Life, parenting, Relationships, Spirituality, Uncategorized and tagged death, family, Life, Mid-Life, obituaries, relationships, women, Writing. Bookmark the permalink. I like your sentiment that everyone is famous. This struck me because not too long ago, my son proclaimed that he wanted to be famous. This made me sad because I wished his young mind could realize that these people aren’t any more special just because we recognize their names or faces. I enjoyed your Memorial Day post yesterday. In this crazy, busy world we must stop and remember. I am a health care provider for veterans and their service to our country is admirable. Oh, I just loved this post! “…I’ve decided that everyone is famous. Each person has lived a life completely unique to anyone else and they touched the lives of many people along their life journey.” This is so true and something that says we should all be honored in some way that stays forever on this earth. Your thoughts about your mother’s aging are something I contemplate about my own parents a lot lately. My father, especially. In fact, it nags at me about how much I need to get over to their house and spend some time with them more. I don’t read the obituaries on a regular basis, very seldom, actually. But my sister’s husband reads them regularly. Thank God, or I would have never known when my ex-husband passed away about 4 years ago. I was able to attend the funeral with my father (who he really got along well with). It’s been a rough couple of days. My mother fell twice after I left on Sunday. The second fall she hit her head and got stitches. She is weak and will be getting some rehabiliation to stabilize her condition. Prayers requested for her. Request heard and prayers are being said immediately.